I love Pad Thai. Absolutely love it. It is one of those dishes that I crave (kind of like sushi, taco time hot sauce, jalapeno chips, etc). Sadly, it is also one of those dishes that every time I eat, I feel guilty as I know it isn’t good for me (especially since I have no portion control when I eat it). Thankfully, a while back I stumbled on a lightened up, “healthier” version of Pad Thai in one of my Cooking Light magazines. After making it the first time, I was sold. And now, any time I get that craving, I add this recipe to my weekly meal plan. I have also used this recipe when we have had company and it has always been a hit! Highly recommend giving it a try. Cook noodles according to package directions; drain. While water comes to a boil, combine sugar and next 4 ingredients (through Sriracha) in a small bowl. Heat a large skillet or wok over medium-high heat. Add oil to pan; swirl to coat. Add tofu pieces and cook until lightly brown. Add onion pieces, shrimp, and garlic; stir-fry 2 minutes or until shrimp is almost done (or warmed if you use the pre-cooked kind). Add cooked noodles; toss to combine. Stir in sauce; cook 1 minute, stirring constantly to combine. 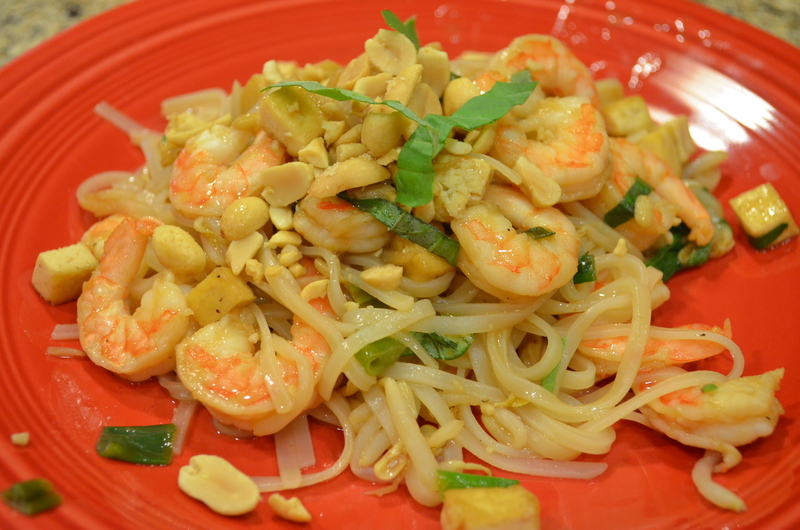 Arrange about 1 cup noodle mixture on each of 4 plates; top each serving with 1/4 cup bean sprouts, 1 tablespoon peanuts, and 2 teaspoons basil. Enjoy! So glad it is the weekend! Much needed. Very much looking forward to the BBQ we have tonight at my best friend Katie’s house. Now that Ash and her family have moved back from Oregon, it will be the first time in a long time that my group of girlfriends from growing up will all get together (with families) and spend some quality time together 🙂 Rest of the weekend is cleaning, errands, relaxing, etc. We also have tickets to the Symphony tomorrow night and on Sunday afternoon we are celebrating my mom’s birthday! 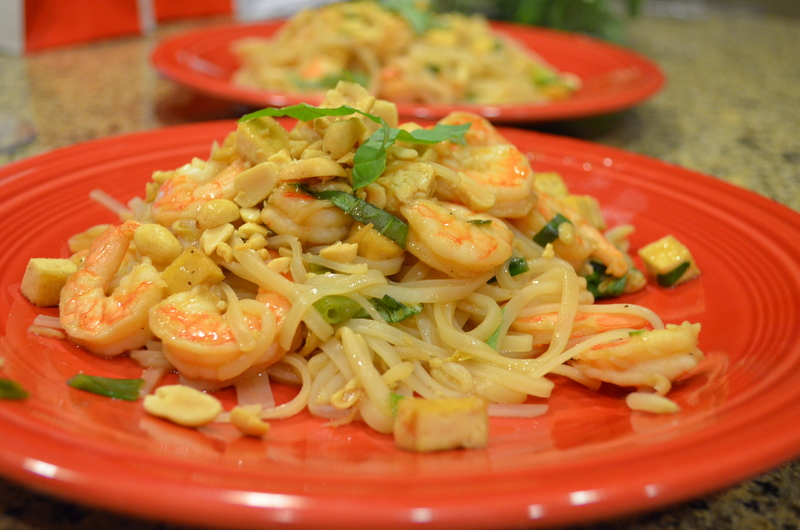 This entry was posted in Recipes and tagged Delicious, dinner, Pad Thai, Shrimp, Tofu by Pieps Perfect Blend. Bookmark the permalink.